On January 26, 2018, Manor College held its 15th Annual Founders Day, where 150+ people from the Manor community gathered for three different on campus events to commemorate this annual day of celebration. Each year on Founders Day – two prestigious awards are given – the Mother Josaphat Medal and the Educator of the Year. 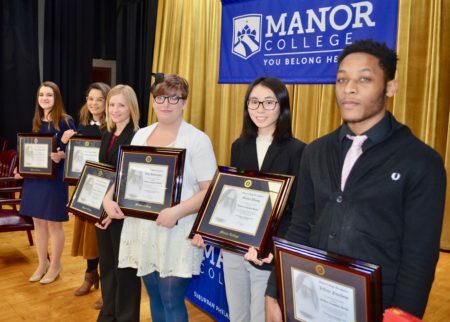 In the months leading up to the yearly tradition, faculty and staff members nominate students who portray strength of character, willingness to serve, and the qualities that embody the mission of Manor College for the Mother Josaphat Medal. 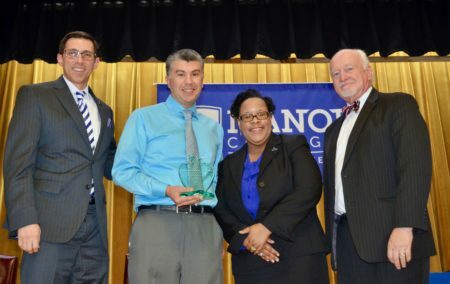 Students have the opportunity to nominate outstanding faculty members for the Educator of the Year award. Another important aspect of Founders Day is the presentation of a large donation from the Manor College community to a specific charity.For the 15th Annual Founders Day, the selected charity was the Manor College Bird Feed, a brand new on campus food pantry to benefit the Manor College community. 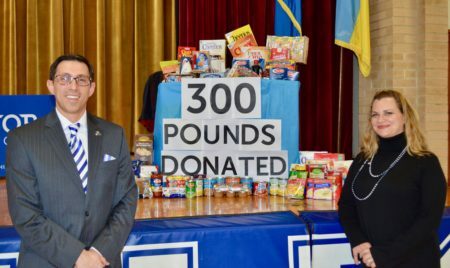 The Manor community collected 300 pounds of canned goods, food and toiletries for the Bird Feed and presented their donation to the Bird Feed on Friday, January 26. This year, the six Mother Josaphat Medal finalists were: Melisa Phung, Jeffray Funchess, Amy Daskilewicz, Olena Prikhodo, Jessica Sant-Ana and Marta Penkalskyj. Each of these students were nominated multiple times and are extraordinary in what they are achieving on and off campus in terms of service and making the world a better place. Phung not only excels academically; she possesses traits of charity and service, as well. She works as a group leader at a Korean summer camp and volunteers at a rehabilitation center, working with patients on improving their diets. At Manor, she is a member of Phi Theta Kappa honor society and has been named a Jack Kent Cooke Transfer Scholarship Finalist. An RA and a campus leader, Jeffray Funchess is an accounting major who continually goes above and beyond to offer help to anyone he encounters. Funchess is always thinking of ways to support students and find engaging and motivating activities for them. Funchess has volunteered in elementary schools and day care centers and teaches self-defense class to children. Currently, he is working on several projects to assist the homeless in learning skills and trades. Amy Daskilewicz is a very involved student who is Vice President of Senate, President of CAB, a Student Ambassador, Campus Ministry President and a Veterinary Technology major. Amy’s passion for animals and for Manor College is evident. She is a stellar student and Manor College is lucky to have her! Olena Prikhodo is a part of the post baccalaureate paralegal certificate program. She is an active member of both the Justice Studies Association and Rotaract. She has started several fundraisers including the Halloween collection, where several members of the Manor College community went trick or treating for canned goods for the Bird Feed. Outside of Manor, she interns for the Law Offices of Cataldi and Associates and additionally tutors in the Learning Commons. Prokhodo’s strong Manor spirit is unmistakable! Jessica Sant-Ana is also a student in the post baccalaureate paralegal certificate program. Originally from Brazil, Sant-Ana is very involved at Manor and spends a great deal of time volunteering in the Justice Studies Association and Rotaract Club. She also is assists others who are having problems with their citizenship status, and participates in the immigration clinic run by Professor Mary Sims. While all six of these finalists are excellent students, each year it is the duty of the Manor College Founders Day committee to select one student to be the Mother Josaphat Medal winner. The 2018 Mother Josaphat Medal winner was Marta Penkalskyj, a sophomore liberal arts student. Marta is a graduate of Saint Basil Academy, and is involved in a great deal of volunteering. She spends her summers in Ukraine with the St. Sophia Association, teaching teaching English to to Ukrainian orphans, refugees and children in need. At Manor, Marta is involved in several clubs including CAB and Hands on History. She also works in the Ukrainian Nest every Saturday. Penkalskyj emulates responsibility, dedication, and service in all she does! The 15th Annual Founders Day was a huge success and the entire community is proud of each nominee and winner. This is a special event that is important to the college as it represents the founding of the College. It also offers an opportunity to recognize those students and faculty members who strive to live the Manor College mission every day.